The Budd SPV, a failure or a head of its time. In todays enviroment with AC locomotives and electronics galore it would seem a SPV would be maintainable. With 30 actual cars built from 1979 to 1981 it was not even a small class . Ten cars for MTA(metro North) shell no's 2021>2030. There were extra shells built of which 3 are at Delaware car Company plus 10 shells cut up at the former Red Lions plant in Philadelphia. The cars had two Drive engines, stock 360 hp Detroit 8V-92's and one aux(HEP) Detroit unit 4V-92 of 35 Kw (the Conndot cars had Lister-Petter Aux engines) at 127 000 Lbs it only weight in 10 000 lbs over the RDC. Is it possible that the SPV maintainence requirements were too fussy for North American practices of the time (or even nowadays)? I do remember many 'advanced' products of the late 60s - early 80s were not very durable and required constant maintainence and adjustment - equipment was not very robust and failed often under harsh field conditions (this applied to a lot of complex technology of the time such as automobiles, building support systems, military equipment, etc., not just SPVs ). Only during the 80s did complex electronic and computer systems start to become really reliable and robust (this coincided with the beginnings of Quality movements throughout American industries). Perhaps if they had kept the SPV shells (which were more or less proven Amfleet knock-offs anyway), and replaced the electronics and control systems etc with proven, reliable equipment, the SPV would be around today. I've always been partial to RDCs, so I had high hopes when Budd introduced the SPV. I had just started working for the AAR in Washington, and my boss gave me the invitation he had received to a VIP reception hosted by Budd to "roll out" the new car. (They were giving rides out to Bowie and back from Washington Union Station). The reception was in the Presidential Waiting Room at Union Station, and Budd had really pulled out all the stops. I still remember the wonderful food and the open bar (it beat the heck out of the reception Bombardier threw for the JetTrain in the same space two years ago). I took several of my friends from grad school who were in town for the annual TRB meeting. We wined and dined, got a tour of the car, and got our ride. The prototype had a wierd fiberglass shovel nose on one end to make it look more like a high speed train; otherwise it was a normal SPV with (IIRC) long distance seats inside. That was January 1978. This is 2004. Lot of years in between. The Budd Company Red Lion Road plant was a customer of mine in the late 70's and early 80's. I had many opportunities to get into the plant during it's last days, inlcuding the SPV line. Needless to say, the place was a railfan's delight. I was even fortunate enough to get a couple rides in the SPV's while they were testing on the in-plant trackage, and remember the testing that was done "at speed" along the ex-Reading West Trenton line. My favorite recollection....pulling into the plant on a cold winter morning and seeing a cart full of batteries cabled up to the demonstrator. Someone had left the lights on for a few days, they were jump starting the train. I guess it was too much for AAA to handle. Many in Philadelphia said that Septa's award of the Broad Street Subway car contract to Kawasaki was the nail in the coffin for Budd. Besides being a terribly short sighted decision and the ultimate insult to a company that provided thousands of jobs to the city, I suppose it was just that. Budd was also trying to get into other areas of railcar manufacture, I remember a couple tandem hopper cars sitting around and the company being renamed to Transit-America right before its' demise. None of these things panned out. Today, there are virtually no traces of the plant left, it is now a golf course. RIP Budd Company, fortunately many of your products are still around to help us remember you by. Where did the Demonstrator 2000 end up? I had heard that her high speed nose got scrapped at Red Lion and that 2000 recieved a conventional nose before Budd closed. Also does anyone have a serial # to unit number chart? I am trying to find the serial / build number for MNCR #293 for the Ct Eastern RR Museum in Willimantic ,Ct. The Demostarator got cut up at Red lions road before the plant came down. And if you get hold of Chuck Crouses book the RDC story ISBN 0-9612814-2-1 you find out that MNCR is the 24th SPV built with SPV serial number 2024 built October 1981. Do you happen to know where budd stamped the serial #s onto the cars or where they hung the build tags? I want to double check that MNCR didn't renumber units or the serial got mis-recorded. No the units were not renumberd. the 293 is as it is. I don't doubt that these SPV's were junk - I've never heard otherwise. But what was the differing factors from the RDC, a smash hit, and the SPV, the biggest dud since Edsel? a lot of difference. a RDC was two bus type drives and a ciommon 64 volt electric system. the SPV had two bus drives, a HEP generator and all things powered by HEP generator, it also had to many gadgets like electronic gear switching etc. Jaap, the SPVs had, as designed, all wheels driven by a smilar drive to the RDC plus a driveshaft in the truck to power the end wheelsets. 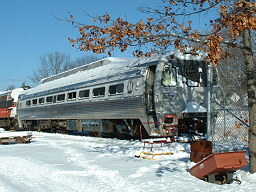 The ConnDOT cars had the outer wheelsets disconnected to conform to train crew union rules. Is it possible the cars weren't designed to run on four wheels, and that this may have contributed to their high breakdown rate? Or were they just poorly designed in any case? I agree that the cars were ahead of their time, but today their design would probably be considered stark simplicity by comparison to the computerized robots on the rails today. Both MTA and CDOT(Amtrak) cars had outer axles disconnected. The CDOT(Amtrak) cars as soon as timeclaims were filed by Fireman union. The MTA cars came without the driveshaft but the drifeshafts were deliverd on pallets and sat stored in Harmon for years. The drifeshafts were stored in lime green NYC box car near fuel pad. The failure of SPV was due to high speed diesels (more maintenance) over complicated transmissions with gear changes but managed by electronic logic boxes, the highspeed APU(hep) which if failed dropped everything including compressor, cooling fans, battery charger, etc etc etc.